It is an experience all teachers recognize and attend to on a daily basis…...yes, student frustration. Often frustration is quieted, passed over, or viewed as a minor distraction that can be attended to at another time to move through a lesson. 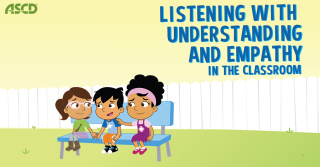 But what if we asked: “How can this moment of frustration become a learning experience for all students?” Well, “Listening with understanding and empathy” can be the piece that cultivates positive and productive behaviors that we want all children to embrace. Student: I am struggling with these problems. All the other students are getting them right and I am not. I feel stupid. Teacher: You seem to be struggling with the homework last night. You feel that everyone else is getting the problems right and you are not. I can understand what it feels like to not beable to solve math problems. It is not always easy to figure out the answers. Student: How come everyone else can do it and I can’t? Teacher: You seem confused about solving these problems. Let’s try to see how others in the group solved the problems, and see if that helps you out. At this point the teacher has modeled the act of listening with understanding and empathy for all students within the group. She did not focus on the reactive behavior, but instead on paraphrasing and understanding the frustrated student's thoughts and emotions. She made it a point to figure out how the student was feeling and let him know that she understood those feelings. As educators, our goal is to provide students with effective ways of learning and thinking. We strive to create opportunities to help students grow and develop strategic habits for their academic success. Listening with understanding and empathy is a habit that extends far beyond the classroom. Students are more likely to display this behavior if we cultivate an empathetic classroom environment. In doing so, we create a space where it is possible to work through frustration by giving them the tools to learn how to work through it themselves. Dr. Daniel Vollrath has served as an educator for twelve years within a variety of educational settings and grade levels. As a United States Professional Development Trainer with the Institute for Habits of Mind, Daniel provides consulting to school districts around the nation on how to infuse the Habits of Mind into everyday teaching and learning within the classroom. His expertise is documented through a doctoral study titled Developing Costa & Kallick’s Habits of Mind Thinking for Students with a Learning Disability and Special Education Teachers (2015), which has gained attention within the world of special education, specifically in the areas of inclusive learning environments and 21st century skills development for students with learning disabilities. Most recently, in July of 2017 his research was recognized at the National Principals Conference in Philadelphia.